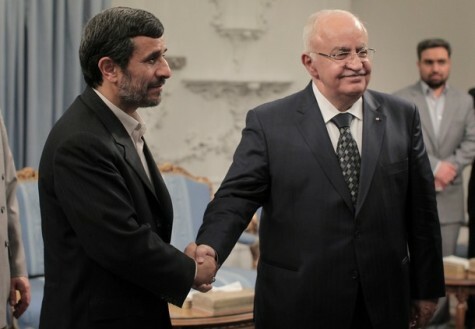 Iranian President Mahmoud Ahmadinejad (R) and Azeri Deputy Prime Minister Elchin Efendiyev meet in Tehran on March 28, 2011. 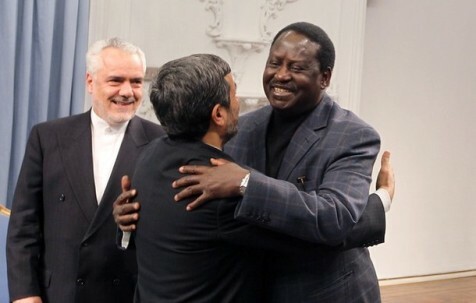 IRAN, March 29, 2011 (KATAKAMI/COM) — Iranian President Mahmoud Ahmadinejad says Tehran and Baku enjoy amicable relations and the two neighbors’ intertwined security and development call for further cooperation, Press TV Channel reported. 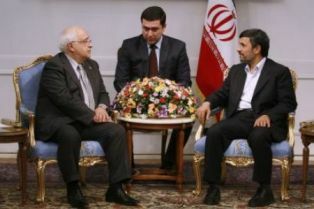 “Iran regards the development and progress of Azerbaijan as its own and is ready to promote bilateral cooperation in line with the two countries’ national interests,” said President Ahmadinejad in a Monday meeting with Azeri Deputy Prime Minister Elchin Efendiyev, who was in the Iranian capital, Tehran, to attend the second Nowruz International Celebrations. He added that the Iranian and Azeri people have always supported each other and pointed out that no obstacle can prevent the expansion of cordial ties between the two countries. The Azeri official, for his part, praised Iran’s efforts to hold the celebrations on the occasion of Nowruz and the beginning of spring and said Nowruz is the feast of security and solidarity and strengthens bonds between nations. Efendiyev expressed his country’s willingness to bolster “peaceful and stable” ties with the Islamic Republic in all spheres. The second International Nowruz Celebrations wrapped up in Tehran on Monday after participants issued a Nowruz declaration calling on regional people to commemorate the ancient tradition of celebrating the Persian New Year and concentrate their efforts in promoting Nowruz traditions through cultural, artistic, scientific and educational programs. Nowruz, which coincides with the first day of spring on the solar calendar, is mostly celebrated in Iran, Afghanistan, Azerbaijan, India, Kyrgyzstan, Tajikistan, Pakistan, Turkey and Uzbekistan. 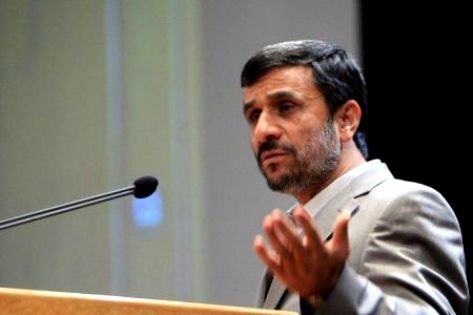 IRAN, March 15, 2011 (KATAKAMI.COM ) — Iranian President Mahmoud Ahmadinejad warned against Western military intervention in Libya in an interview with the Spanish TVE1 channel on Tuesday. As reported by RIA Novosti on Tuesday, fierce clashes between Libyan rebels and forces loyal to leader Muammar Gaddafi have been raging in Libya since mid-February, claiming thousands of lives. The G8 foreign ministers discussed implementing a no-fly zone over the north-African country on Monday and Tuesday in Paris, but were unable to reach an agreement. 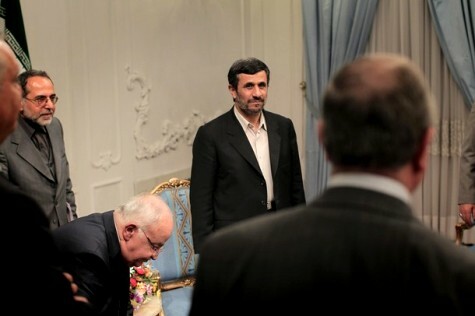 The Iranian president accused Western powers of causing the Libyan unrest. Pro-Gaddafi forces attacked the rebel-held town of Zuwarah in northwestern Libya on Monday, forcing out rebel forces. They have also launched air strikes on the Libyan towns of Ajdabiya and Brega. Nothing can justify Gaddafi’s harsh military response to his adversaries, Ahmadinejad said. In an interview with the Italian newspaper Il Giornale, published on Tuesday, Gaddafi said the Libyan rebels were terrorists backed by Al Qaeda. 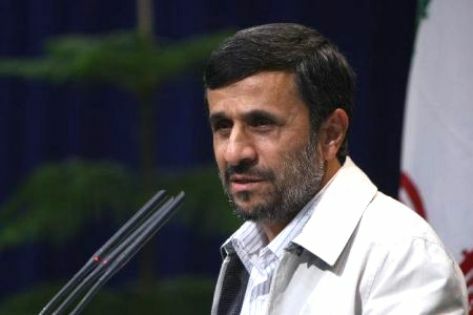 March 12, 2011 (KATAKAMI.COM) — Iranian President Mahmoud Ahmadinejad has spoken strongly against the warmongering nations of the world, calling them devoid of care for humanity, as reported by Iranian Television PRESS TV on Saturday. “Rulers, who have launched the wars, their hearts are devoid of affection for mankind,” President Ahmadinejad said on Saturday, IRIB reported. “The emptier their hearts are of affection, the more [there are] crime and war,” the Iranian chief executive said. “Warfare in Iraq and Afghanistan is an example, which has affected the economy and security of the whole world and everyone has suffered damage from it,” the president said, referring to the United States-led offensives on the violence-scarred countries. Violence resulting from the military presence has killed over one million Iraqis ever since the Washington-led invasion of the country in 2003, says the California-based investigative organization Project Censored. 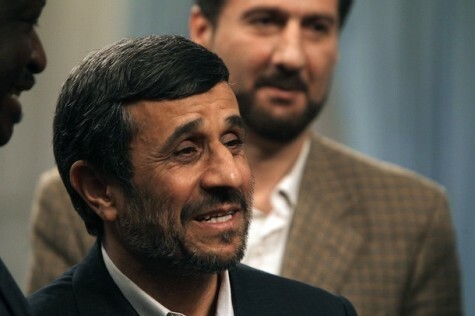 IRAN, March 10, 2011 (KATAKAMI.COM) — Iranian President Mahmoud Ahmadinejad says hegemonic powers are already collapsing, reiterating that an Islamic awakening is spreading across the world, Iranian Television PRESS TV reported on Thursday. “The human society is moving rapidly forward and today’s hegemonic powers, which are unrivaled in corruption, pillage, massacre and crimes, are already collapsing,” President Ahmadinejad said during a visit to the central Iranian city of Qom on Thursday. “An Islamic awakening is taking place in the world. A major movement is underway and we can see its signs in every corner of the globe,” he went on to say. The Iranian chief executive praised the role of clerics in inviting societies to salvation and prosperity and said that on account of clerics’ efforts and sacrifices, a global movement based on divine values is spreading all across the world. 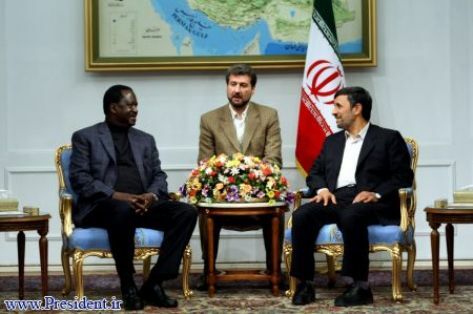 March 7, 2011 (KATAKAMI.COM) — Iranian President Mahmoud Ahmadinejad said on Sunday (6/3/2011) that Iran and Kenya have broad areas for cooperation. 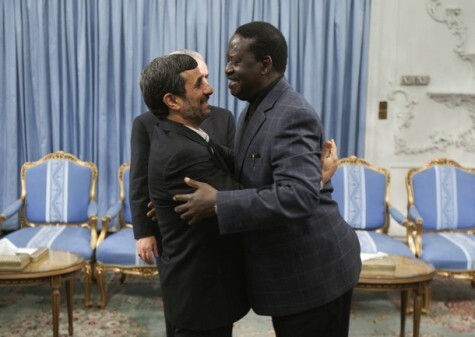 President Ahmadinejad made the remarks in a meeting with Kenyan Prime Minister Raila Odinga in Tehran. He said that both Iran and Kenya are eager to further enhance their cooperation particularly in view of the ongoing international developments. ‘Iran and Kenya are in the same front. 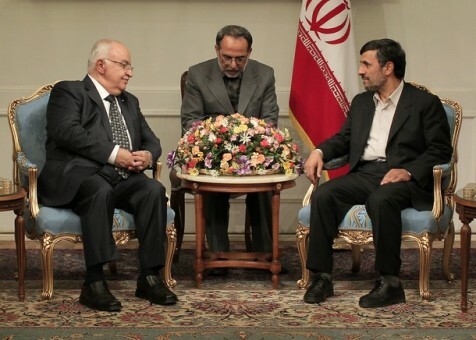 The common culture and viewpoints of both countries have made them get closer to each other,’ President Ahmadinejad added. Referring to great potentials for increasing the level of cooperation between Iran and Kenya, he noted that Iran and Kenya can take effective steps in consolidating their bilateral ties through further cooperation in economic, political and cultural areas. President Ahmadinejad emphasized the importance of paying heed to banking and customs infrastructure of both countries in order to enhance bilateral industrial and commercial cooperation. “Kenya is one of the main centers for independence-seeking movements in Africa. 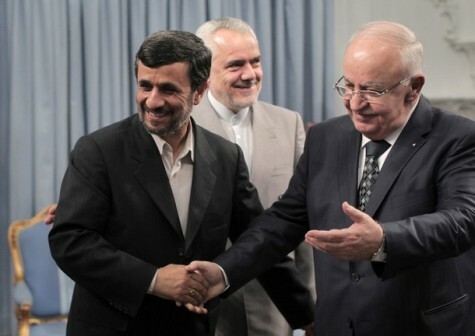 Hence, it enjoys a special status in thought and culture of the Iranian nation,” he added. Kenyan Prime Minister Raila Odinga for his part said that Kenya as a trading center in east Africa pays heed to broaden ties in all arenas.